The workspace's security settings are located under the Advanced security tab of your Workspace settings page. 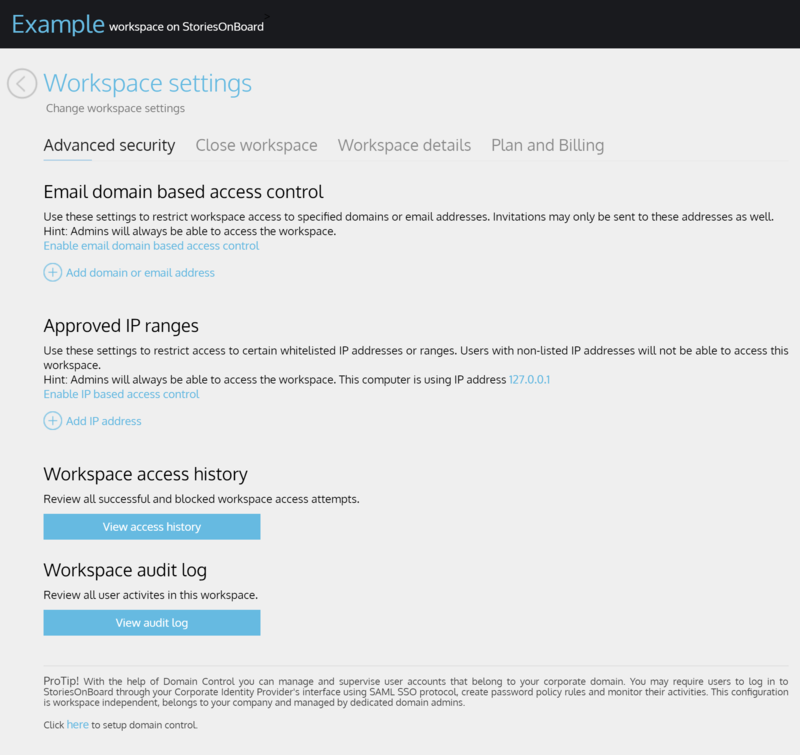 You can access this page from your workspace's dashboard by clicking the Workspace settings link found in the Manage menu in the upper right corner. We offer domain and IP address based workspace level access control and two logs to monitor your workspace. Email domain based access control allows you to restrict access to a workspace and set up a white list based on user email addresses and email domains. Users with email addresses matching your white list will continue to have access to your workspace all other access attempts will be blocked and logged. Add an email address to the list to grant access to a single account or add an email domain (e.g. @yourcompanyname.com) to allow multiple users with matching email addresses to access the workspace. Email domain based access control can limit workspace access only allowing your corporate employees while Domain Control ensures you they follow your authentication rules. Together they can give you full control over workspace security. Creating an IP address white list may also be an important tool for workspace security. By enabling IP based access control you block all access to your workspace. You may add individual IP addresses or wider IP ranges to a list which will form an exception. Users with matching IP addresses will continue to have access to your workspace. IP address filtering and email domain based access control work simultaneously. Users must have an authorized email address and must have an authorized IP address to access the secured workspace. This list shows the access attempts related to your workspace. You may find the users' names, email addresses and IP addresses which might help you in fine tuning your workspace security settings or discovering unwanted access attempts. The audit log shows you all workspace related activities by users. The search filters help you find the records you're interested in.